Here is another recipe that I was dying to learn how to make and finally got to try out after various online findings. 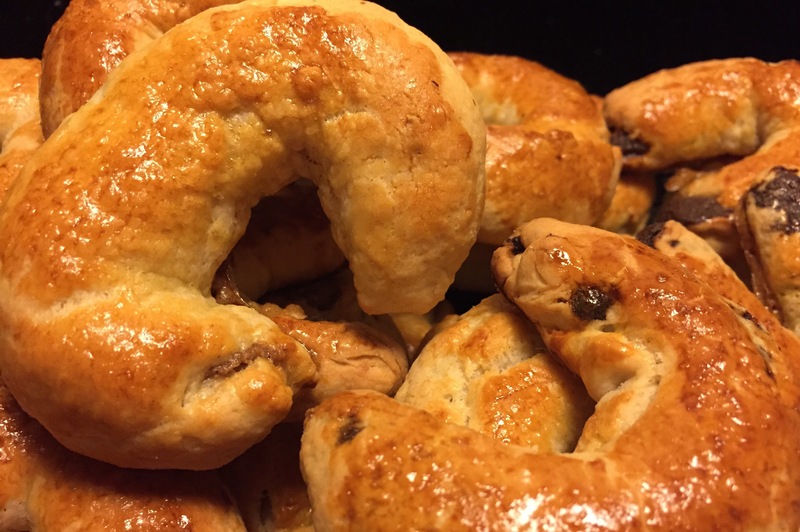 Bratislava crescents or “Bratislavské rožky” are historically tied to my hometown and the capital of Slovakia – Bratislava. After some research, I have also discovered a little bit of their history, which I’ve found quite fascinating. Bratislavské rožky date to our region all the way back to 18th century. They’ve became very popular not only within the city limits but also were regularly delivered to imperial courts in Vienna, as well shipped worldwide. Thanks to August Schwappach, Bratislavské rožky got patented and even won gold medals in Amsterdam, Lyon, London and Chicago. Today, if you find yourself in Eastern Europe and would like to try them, depending which country your are in, the name may vary. You already know Slovak name. Over the centuries, Bratislava’s name has gone through numerous changes, so to this day different countries may lean towards the name’s origin specific for their region. In Austria they are called “Pressburg Kipfel” and in Hungary may be known more as “Pozsony Kifli”. Ok, now let’s get to the fun part. Warm up milk and mix in, until fully dissolved, yeast and honey. Let it sit for 10-20 minutes. 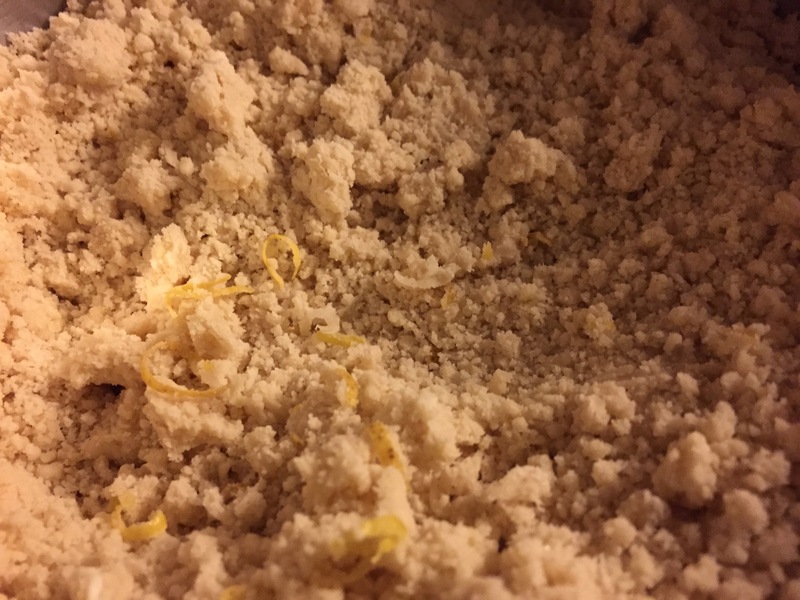 Using either a food processor, blender like Vitamix or a Kitchen Aid mixer all dry ingredients and softened butter, until you get a very coarse consistency. Add yeast mixture and if using a Kitchen Aid mixer with a hook attachment, knead the dough until it’s no longer sticky. Let your dough rise for about an hour. I like to put boiling water in a pan on a lower rack in my oven, and place dough with a clean towel over it and place it on a top rack. It’s a nice trick as it makes the rising process way more effective where your dough will at least double or triple in size. 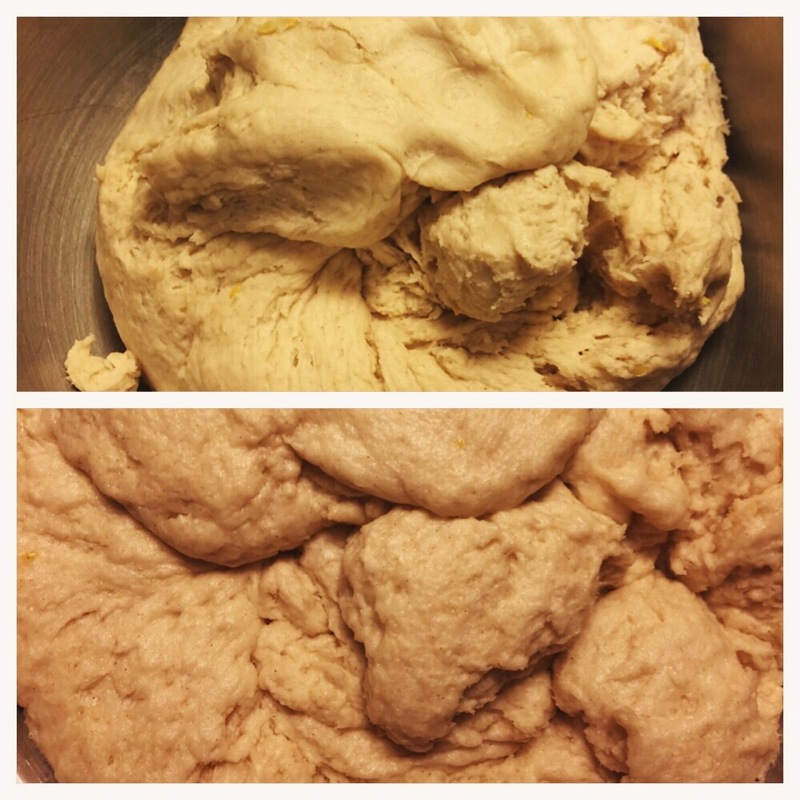 Dough before and after rising. While your dough is rising, take this time to prepare your filling. Its consistency should be very thick, so during baking you won’t have your filling run out in case your dough cracks. Depending on how much dough you have, take part of it onto a floured surface to roll it out into large rectangular. You may find your dough very sticky, so use more flour as needed. It will become very elastic and stretchy. 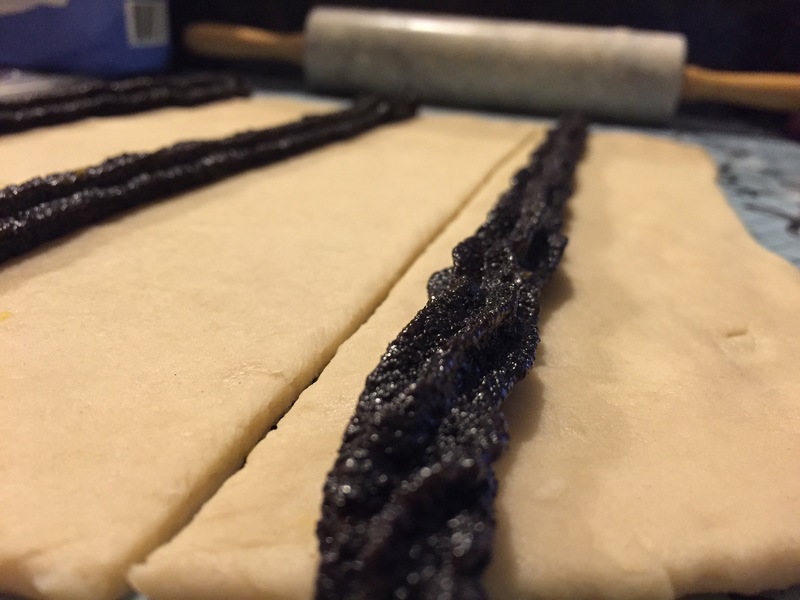 Cut your rolled out dough into about 3.5 inches wide strips and line them with your filling along side one edge. Roll up the dough into long rolls. Don’t be afraid to pull the dough over your filling while rolling it up, as it should be quite stretchy. Cut your roll into about 3.5 inch long pieces. Pinch dough on each end to close the openings, if you can and roll them out into about twice their length while shaping them into “C”, if filled with walnuts or “U” if filled with poppy seeds. Top: “C”-shaped crescent filled with walnuts. Bottom: “U”-shaped crescents filled with poppy seed filling. Brush your crescents with egg yolks mixed with a little bit of milk and sugar.For each yolk, add 1 tbs of milk and 1 tsp of sugar. To achieve nice marbling effect on your crescents, move them to a drafty place for about 20 minutes until the egg wash dries and then move them back to a warm place for another 30 minutes to rise. When I made mini crescents, about 3.5 long, they took about 12 minutes to bake. While doubling their size, their baking time increased to about 20 minutes at 400 F.
I know that traditionally walnut and poppy seed fillings are the most common ones, but I love my pastries to be filled with tvaroh (similar to farmer's cheese). I usually make my own, since you can't buy it in USA and then just mix it with vanilla sugar, egg and golden raisins that I soak in dark rum. If you wondered where to buy poppy seeds in USA, I personally order them from Nuts.com. I like the 5 lbs bag and then grind them into a nice paste. Years ago, I have purchased an "old school", hand-cranked poppy seed grinder, like we've used back home growing up. Trust me, it's quite a work out to grind them. You can find electronic grinders but I've tried my Vitamix and it seemed to work quite well.